The EXELON 3x50 features enhanced operating characteristics. Combination of a CF-Super tube and a high-aperture 50mm R-Contact objective lens provides a distortion free, crisp and geometrically precise image on the entire surface of the screen. The CF-Super light amplification ratio of 1200 essentially exceeds a similar value of the gen. 1 tube. This feature gives the EXELON 3x50 a great viewing range and high degree of detailed recognition of observed objects. In field conditions (under natural night illumination of 0.05 lux) the unit can detect objects at a distance of up to 500 meters, and recognize them within a 230-270m. range. 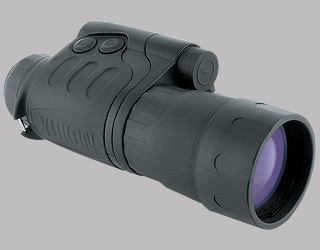 Wide field of view perfectly describes the EXELON 3x50 as a monocular ideally suited for observing moving objects. Along with fine ergonomics, the EXELON 3x50 can be easily transported and is perfect for use in harsh field conditions (hunting, fishing, and hiking) as well as for nature preservation purposes. Coupled with various accessories (IR flashlight, photo and video adapters), the EXELON 3x50 is not merely an observation device, but also an excellent means for image recording. CF-Super Tube Due to the spherical shape of the tube's photo cathode, the device produces enhanced resolution on the entire surface of the screen, measuring from 42 lines/mm in the centre to 32 lines/mm on the edge. Optical Arrangement Combination of the tube and R-Contact 50 mm objective lens of the provides crisp and geometrically precise image without distortion even in the peripheral areas of the tube ─ s screen.